Robots, robots everywhere, with barely time to think (about the coming robocalypse.) Mechanoids are a fact of life folks, and if you need proof then learn about Chinese farmer Wu Yulu and his list of robo pals, and Stanford’s freaky sci-fi-esque perching UAV. Wu Yulu is something of a one-man mechanoid phenomenon–he’d almost fit the geeky home-tinkerer stereotype from many a 1980’s vintage sci-fi movie. Wu has produced 38 individual robotic inventions, and has been invited to present some of them at the opening of the Shanghai World Expo, such is his local fame and reputation according to the China Post. But what are these fantastic creations for? 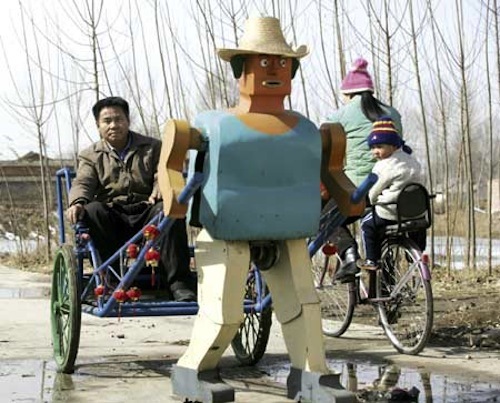 They’re all sorts of things, from the practical farmer assistant ‘bot that can water soil for you, or the walking robot rickshaw puller to the merely amusing–like his running robot dog (and if you thought of Doctor Who’s K9 at that point, then bonus Brownie points for you!). They’re not amazingly sophisticated creations, as admittedly none of them is going to rival Asimo for his mastery as a super-smart walking machine, but there’s an undeniable air of pure invention to the robots. Wu is even planning a new one that can spring from a wall and land like a man on two feet, which will “definitely surprise the audience.” And that sort of tech, perhaps even more in China than in the U.S., may pique the interest of the military. Though, frankly, the military have quite enough robot toys to be getting on with. The latest creation is coming out of Stanford’s Biometric’s lab, and was shown in action during National Robotics Week. It’s a perching UAV, which is something of a misnomer–think of it as a flying robot spy automaton that can sneak up to, say, a target building and stick to the wall as if by magic. When it’s spying job is done, it then simply unlatches, like a leech full of data rather than blood, and fly off. Check out the video–which is sure to elicit a shiver, and evoke memories of exactly this sort of spy drone from the Matrix, or James Bond, or the sci-fi movie of your choice. The UAV is recognizably a typical remote-control aircraft at the mo, but its application of super-grabbing spines, meaning it should even be able to stick to large moving vehicles and ride-out wind buffeting, can easily be extended to other UAV designs.